I have baked this Cake for a 'Cake Walk' game that I have signed up at my First Grader's school as part of of their 10th Anniversary Carnival. First,I didn't know What is Cake Walk Game, I thought contestants have to walk holding the cake with out falling..! ( sounds funny right if you know what is a Cake Walk, if you don't know keep reading). I have arranged this Delicious Chocolate Pound Cake in a beautiful plate and left at School in the morning ( the event is scheduled for evening). So I went to school with my son in the evening, as after participating in several games and having fun, finally we came to the last game that is Cake Walk! They have arranged all the cakes on the Table, so I have looked for mine, didn't find it. Then I have started asking around about the game, So I came to know this is how the Game will be played, all the Kids will be walking in squares that has numbers in them in a line, when the music stops, they call out 3 random numbers, they are the winners for the round, then the winners will go and claim the Best Looking Cake. Hence the reason for my cake to be gone :-), the sad part for me is It's Gone along with my Beautiful Plate :-(, the Good part about it is now I know about the Cake Walk game, after all it's not Walking with Cake. :-))! So That's the fun memory for me to keep along with this recipe! 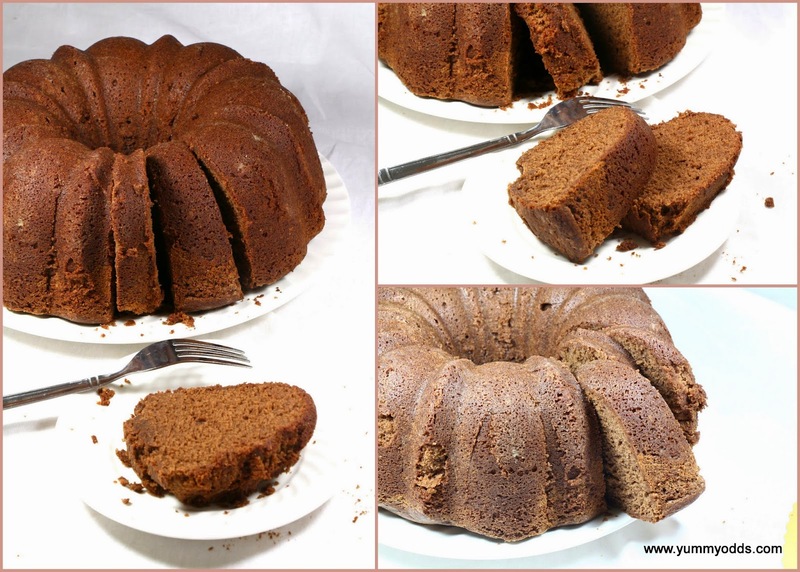 So Coming to recipe, I have browsed several recipes when my mind is set on Chocolate Pound Cake. Got to tell you, the ingredients in several of the recipes for the Chocolate Pound Cake are sort of heavy... (like 8 Eggs, Cream etc) all of those recipes did not turn me up. So Finally I am set with this recipe from Taste of Home, as the ingredients are simple and have all of them in my pantry at that time, and the end result is soft in texture, rich in looks and delicious in taste, Absolutely Divine! Here is the recipe, Njoy! In a large bowl, add softened butter, shortening and sugar, whisk it until light and fluffy. Add eggs, one at a time, beating well after each addition. Combine the flour, baking powder and cocoa. Combine the milk and vanilla extract. Add dry ingredients to creamed mixture alternately with milk mixture. Mix well. Cool for 15 minutes before removing from pan to a wire rack to cool. Sprinkle with confectioners' sugar if desired. Sliced it Enjoy as it is or Serve with a scoop of Vanilla Ice Cream. Hmmmm Yummmm! The ingredients are little heavy than normal Pound Cake Recipe, so your Bowl will be full when you mix up the whole batter. The tip I give, take pretty Large Bowl than usually use for other cakes, this will need Extra Large Bowl, I ended up converting to 2 Bowls as I keep adding the Ingredients. My Bundt Pan is Full when I poured in this mixture also. You need have 10 Cup Bundt Pan to fit in this size. Next Time I will try reducing the ingredients to half to get the half-size Bundt Cake. until then take care and have fun! mouth watering and perfect cake. Hard to resist to this super delicious pound cake. Perfect texture, very tempting cake, no wonder it was gone..